All right Team GeriAtrocities! 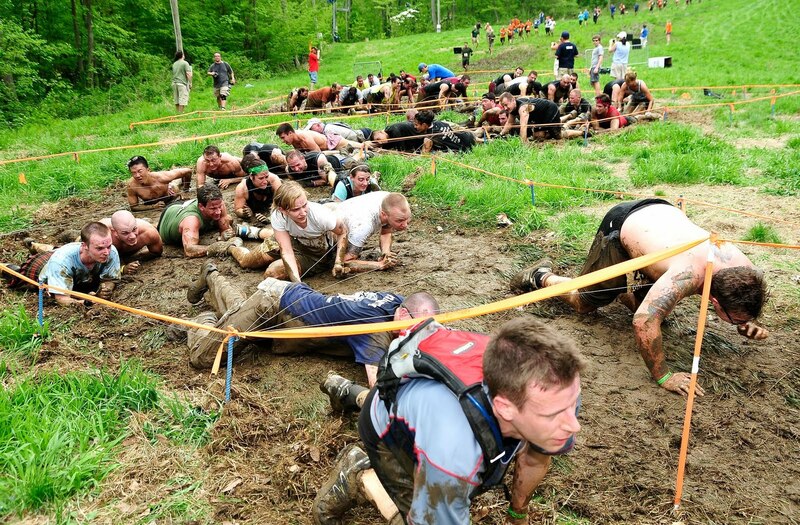 The Tough Mudder is in eleven weeks and its time to finish up our base training and get more specific. Two posts ago, I talked about the obstacles and what the general fitness needs are going to be. I now want to get even more specific about what we’ll be doing over the next several weeks to get ready to take on this challenge. This is a significant challenge and the bulk of our base training needs to be in place by eight weeks out. At eight weeks out, we can only work with what is already in place, we can’t significantly increase strength or endurance. Our main goal will be to hone skills and mitigate weaknesses. No mud yet, must have just started. Distance Running: The race is eleven miles and even though we will only run three of those miles continously, we need to be able to run the total distance. Some of us already can, some of us are struggling to get there. Our bodies need to know what eleven miles feels like and have the endurance, stamina, tendon strength, and conditioning to go the distance. Yes, there will be obstacles, but the above qualities are best trained through low and slow, long steady distance. There is no substitute for getting those miles in and it will make your race much easier. If you are only now starting to run, work up your distance on a long run for the next six weeks. After that, we will be adding more distance to our obstacle training and dropping back our distance training to attack those first three miles. The cumulative weekly distance will probably remain somewhat similar. Speed Intervals: Speed training will help you move faster more efficiently and with less chance of injury. It also trains the energy systems that will help us to put in the lactate threshold and anaerobic strength efforts of climbing over obstacles before transitioning back into a run. Why is this necessary? Its necessary for a couple of reasons. The transition between obstacle and back to running is where many participants get gassed. Training to overcome this predominant fatigue trap will make your race easier. 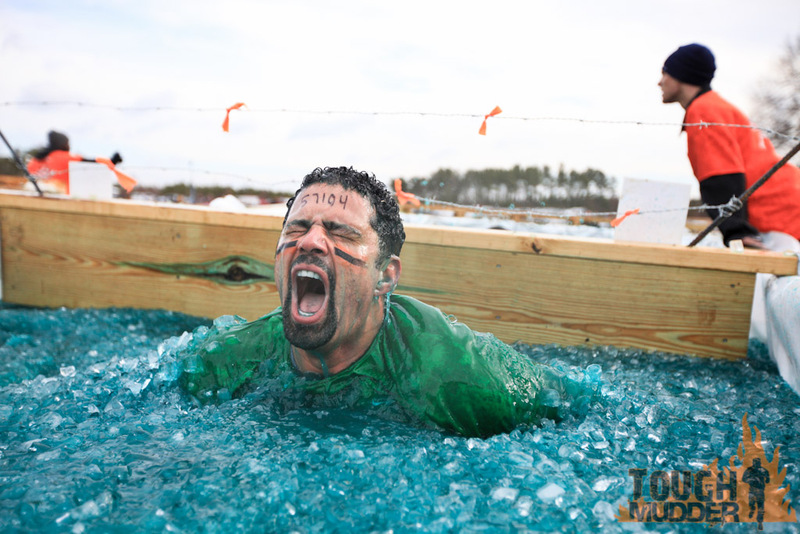 The second reason is that a large number of Tough Mudders who don’t complete the race don’t do so due to hypothermia. Being able to come out of the water and continue running will be important for restoring and maintaining body temperature. Get out and keep going. The speed training that I am going to suggest will help all of us both in the obstacle transitions as well as running with better form for longer periods of time. It will help you maintain good form after fatigue sets in and your good form and efficiency will do a lot for preventing injuries on the course. At this time, I would recommend introducing some speed intervals. I would do them no more than once a week and they should be of high quality. The main goal is to introduce some short bursts of speed with good form and near maximum effort followed by a 3-4 minute period of running or jogging. You will then recover for an equal amount of time before attempting the next one. Recovery must be complete so if it takes 10 minutes, it takes 10 minutes. If you do these right, you shouldn’t be able to do more than thirty to forty-five minutes of these including both work and rest intervals. The intervals I’m currently utilizing for myself are a 50-100 m sprint or hill run followed by a 3-4 minute run at my usual running pace. I take a five minute rest period and then repeat two to four more times. I warm up with some running drills and short sprints first and then cool off by laying on the grass and questioning my motivation for doing such a horrible thing to myself. Avoid hypothermia, it will keep you from finishing. Strength: We can all develop a good amount of strength in the gym, but we should be transitioning that strength now to obstacle specific strength. We need to be able to move our own body weight vertically and horizontally through space. Bear crawls, lunges, pushups, pullups, dips, body rows, press-ups, should all be included in your repertoire. We’ll start introducing more obstacle specific movements such as rope climbs and pulls, monkey bars, wall climbs, and belly crawling as we get into race specific conditioning. If you want to maintain any of your barbell lifts, drop the volume and intensity back such that it doesn’t interfere with your running and recovery. It is important to note here: You will not get any stronger during this time. This race requires strength endurance and to try and increase overall strength will be counterproductive. Dial back your limit strength training to optimize your efforts. since you were in diapers. Obstacle Specific Conditioning: This will be the fun part. We’re going to take an approach that will evolve as we get closer to the race. Our race day conditioning is going to consist of mixing obstacle specific strength work with running in an interval format. The format will be to begin with a mile run and then work at a station for either the required number of reps or a set period of time. 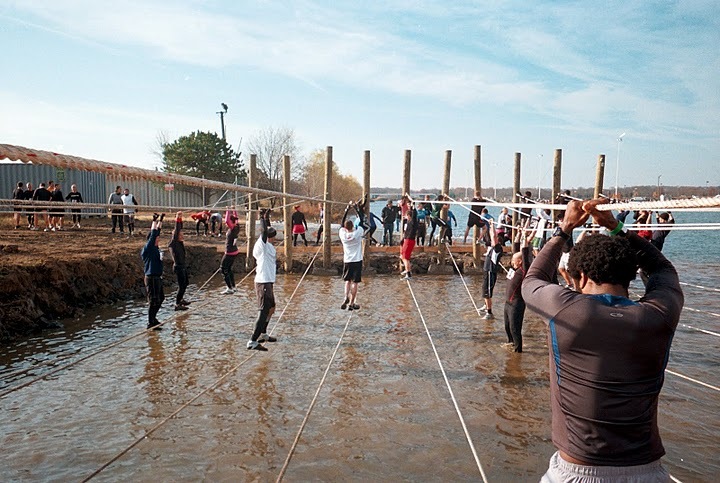 The stations will have similar demands to the obstacles on the course, but many of them will require a bit more effort to complete. We will start by treating each block of running and skill work as a separate independent block. We run, we recover, and then we work on one of our strength stations. We recover, run again, recover, and go to the next station and so on. During this time we will be learning to climb ropes efficiently, climb walls, belly crawl, monkey bars, and all that fun stuff. The main focus during this period will be good running form and becoming familiar with the different challenges. As we become proficient at these challenges we will begin to blend the skill blocks with the running blocks that follow them. We will complete an obstacle and immediately run (or jog or walk) the next distance. We will have a short rest period before attacking the next obstacle. During this time, we will be increasing the number of obstacles and running distances. Finally, during the last 3-4 weeks, we will work on blending the blocks together with minimal rest and maximal proficiency. The focus will be speed. By the laying the foundation of familiarity, proficiency, and good form, we should be able to execute each obstacle and subsequent running period with some amount of grace and agility. Speed is not for the purpose of winning the race as much as completing the challenge in a reasonable time. Too much time on the course may leave one too exhausted to complete it. There is really no point to risking injury while training. A reckless approach won’t prepare you any better, just increase your chances of hurting yourself. By taking things more slowly and focusing on skill development before speed, we get stronger and improve our ability to tackle these obstacles while learning how to do them well. How to put it all together: My most prevalent philosophical training practice is that the individual must improve what he or she needs to improve and not do what everyone else is doing. So, before taking a look at this plan, realize that you may have some deficiencies in your base strength or endurance and you need to address those first before anything else. So, for the next three weeks, if running is your Achilles heel, you need to run more than anything else. It’s really too late to get appreciably stronger, but by practicing body weight strength moves, you can wake up a lot of your previously developed strength potential with lots of practice. I’m thinking this may have to be a practice obstacle. Beginning August 28th, we’re going to start our weekend warrior training with the obstacle course conditioning. We’ll be doing this one day a week, but you’ll still have 3-4 other days to continue making improvements in the other qualities. I would recommend a long distance running day, a speed training day, and a strength day focused mainly on obstacle specific and bodyweight movements. These four workouts will cover the distance training, speed training, strength endurance training, and energy system training that you need to get through this race. If you can handle more workouts without impacting recovery, consider adding in another short run. About a month out from the race, we will want everything we do to be race specific. Distance, conditioning, and obstacle specific strength work three days a week should be all we need to work on at this point. One week out, we’ll do our most challenging training of the cycle followed by a week of lighter workouts focusing mostly on recovery. And then, on October 27th, we’ll see what we’re made of. *I need to credit Dave Van Skike, former pro mountain bike racer, current Highland Games thrower and lifter of very heavy things, with helping me develop this final training plan.